This is a variable clock output device. You can manipulate the speed of the Game Boy processor on the fly with a potentiometer. The pitch of the sound will become lower as you slow it down and it will become higher when you speed it up. You can make some incredible sounds with this kit as well as adding a whole new way to play games! This will limit how fast it will go. Many devices will crash if pushed too far. A 10K SMD resistor is pre-soldered for installation into an Original Game Boy(DMG) or Game Boy Pocket(MGB). It can easily be removed with a razor blade and you may install a different through hole resistor(an 8K resistor is ideal for the Game Boy Color(CGB). With a 100k-500K pot(higher resistance = lower speed and pitch) this kit will go so slow and low that the LCD will not be visible and the notes will sound like a droning "growl"(this can actually be a very awesome effect for music). You can solder a resistor to the through hole "Low Limiter" pads and this will only allow the kit to go as slow as you like. A 100k-150k resistor is recommended. If you would like to change the low limit in an easier way please check out the Variable Clock v3 or v4. -Basic kit: supply your own wire, switch, potentiometer and knob. -Full kit: includes a sub-mini SPDT toggle switch, a micro potentiometer, 1/8" to 1/4" shaft adapter* and enough wire to install it into a Game Boy. Installation instructions are in the last picture. Save the image for higher quality. A printed version comes with every order! 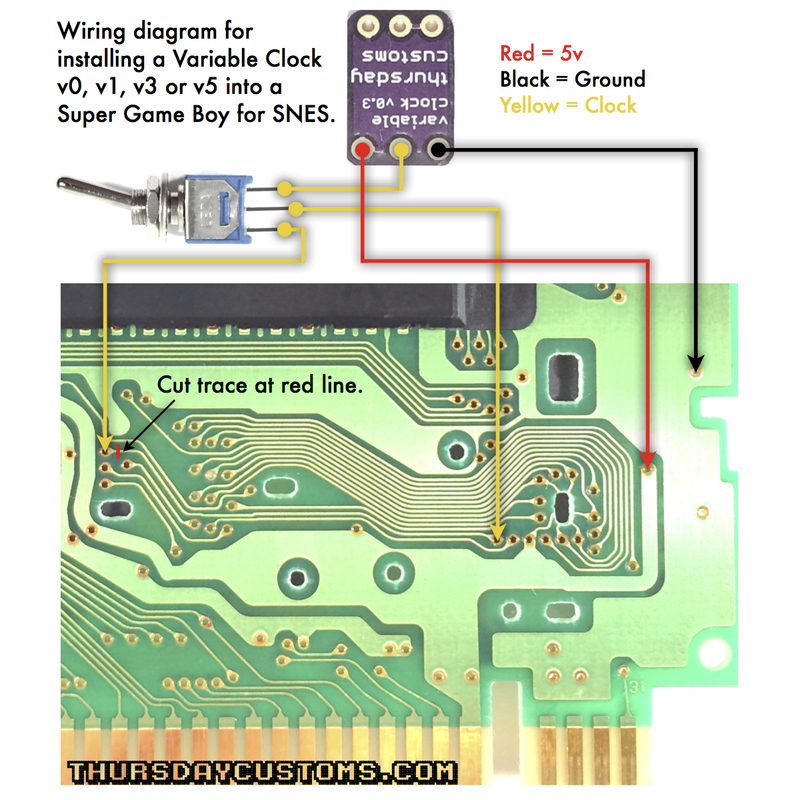 For installation into a Super Game Boy cartridge for SNES follow this wiring diagram.